The latest info from the region’s leading asphalt manufacturer. Baltimore, Maryland (Date) – Cidalia Luis-Akbar and Natalia Luis of M. Luis Construction Co., Inc., was selected to receive the distinguished 2014 Top 100 Minority Business Enterprise Award. 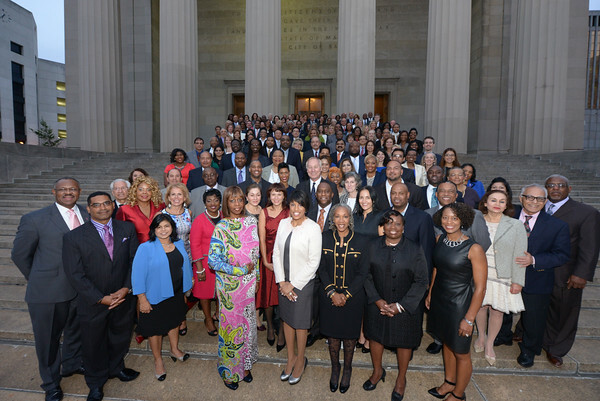 The Top 100 MBE® ceremony is designed to acknowledge and pay tribute to outstanding women and minority business owners in Maryland, Virginia, Pennsylvania, Delaware and the District of Columbia. The awards ceremony took place during Mayor Stephanie Rawlings-Blake’s Minority Enterprise Development Week in Baltimore and was3 held at the War Memorial Hall located 101 N. Gay Street in downtown Baltimore on Thursday, October 23, 2014 at 5:30 p.m. This year’s ceremony host organizations are the Mayor’s Office of Minority and Women-Owned Business Development; MBDA Business Center – Baltimore; Southwest Airlines; BGE; State Farm; Whiting-Turner, and others. Cidalia and Natalia represented M. Luis at the events during the week to include the Procurement Fair and Press Conference, the Women’s Business Summit, and the 8th Annual Top 100 MBE Awards Ceremony.